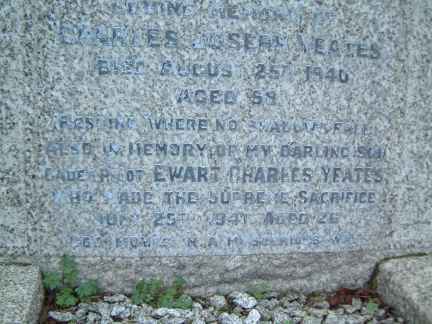 Son of the late Joseph Yeates (died 25 Aug 1940 aged 58. Yeates' mother had married his father, a passenger train guard, shortly after coming to Chippenham in 1912, from Cheddar, to run a refreshment buffet. In 1932 she worked for a Mr Cockram who had an extensive catering business before taking over the Old Road Inn. Yeates was educated at the Chippenham Secondary School and had worked for a short time at Westinghouse and the Wilts Bacon Company. 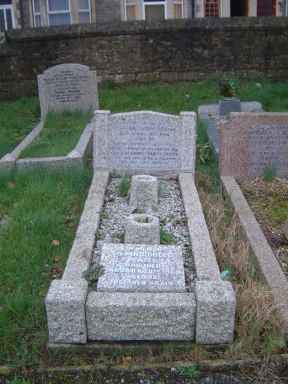 He was a keen athlete and footballer and had a been a pianist in the Embassy Dance Band. Yeates was engaged to Miss Dorothy Short. From Geoff Morse: "From what I understand he actually died in a flying accident at RAF Hullavington. I understand he & a colleague went on an unauthorised flight in a training aircraft but came to grief not far from the airfield."